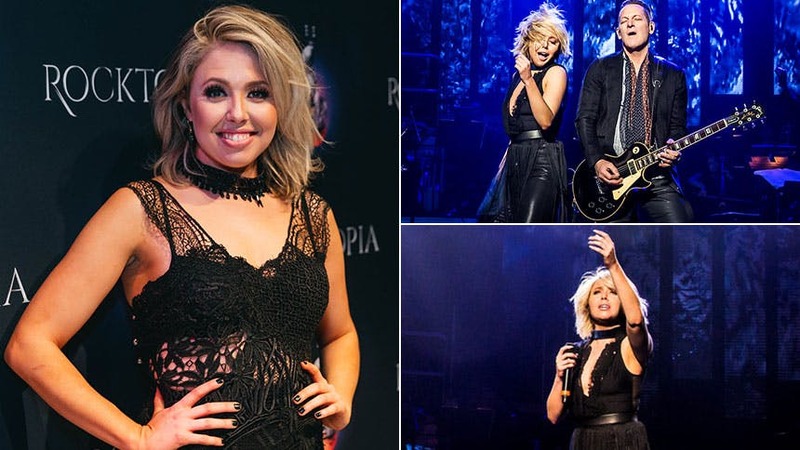 Chloe Lowery makes a killer Broadway debut blowing the roof off the Broadway Theatre in the big, new rock concert Rocktopia, alongside fellow fierce ladies Kimberly Nichole & Alyson Cambridge. BroadwayBox gets to know each of these incredible singers this month in our "Meet the Ladies of Rocktopia" series. First up, Chloe shares with us how yoga helps her voice stay healthy and warm for the run, first discovering her belt, and her wide array of vocal idols. 1. How do you care for your voice during a run like this? Water, Sleep, Yoga, and periods of complete vocal rest! My track in the show is based on my belt, so I have to take extra care and just make sure my voice is rested and hydrated as MUCH as possible. Yoga helps with breath and vocal rest is basically like giving your body a break. 2. What’s your warm-up like for Rocktopia? Depends on the day, but I ALWAYS try to do something physical like yoga before the show. Steaming is key for me as well. I then proceed with a warm up regiment that my voice teacher Matt Farnsworth designed specifically for me and how I have to sing for this show. The warm up includes lip trills and really vocalizing my upper register. I will rarely touch my belt till showtime and just make sure my head and mix voice are completely warm. If those are warm, my belt is guaranteed to be there. 3. Do you remember the first time you felt or knew your voice was special? I’ll never forget the day I actually learned to belt. As a kid, I was primarily a mixer and studied opera. When I was 14, I was in the recording studio working with a producer by the name of Peter Zizzo. He plainly asked me, can you yell "Hey Yeah!” I was like, I can try… And somehow I found my chest voice. This opened the door to many new aspects of my voice and that moment will always be special for me. 4. What’s been the biggest or most challenging sing of your career so far? I don’t think I have a specific “sing” that is super challenging. However as a singer, what I find is the most impressive attribute is consistency. Not perfection, but stamina and consistency. To perform 8 to 9 shows a week in complete vocal health is a challenge and the thing that I strive for. Always impressive when a singer can do it night after and night. 5. Did you ever dream about being on Broadway when you were younger? Were you a theatre kid growing up? Of course! I grew up on Broadway and studied theatre through my youth. I was in Blood Brothers, Pastorale, Closer than Ever, Carnival, etc… I finished high school in NYC so was lucky enough to witness the real deal weekly! 6. What’s been the biggest pinch-me moment of your experience with Rocktopia? um...BROADWAY! It still hasn’t fully sunk in that we are on Broadway. I’m just over the moon and completely grateful. 7. Whose voice did you idolize growing up? I have a wide range of voices that have influenced me. I grew up on Celine, Whitney, and Mariah, which makes sense…But also loved Robert Plant, Anne Wilson and in later years odd voices like Allison Mosshart and Laura Marling. I’m all over the board. 8. Right now, Rocktopia on Broadway features Train’s Pat Monahan, Cheap Trick’s Robin Zander, and Twisted Sister's Dee Snyder as guest artists. If you could invite any lady from the world of rock to Rocktopia for a stint, who would you pick? Dont' miss Chloe Lowery live in 'Rocktopia' at the Broadway Theatre through April 29.